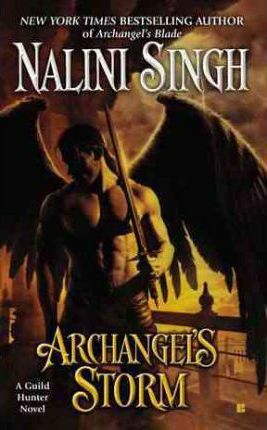 Enter New York Times bestselling author Nalini Singh's darkly beautiful world of archangels and immortal power, as a pact is sealed between two souls bound by blood, stirred by desire, and driven by vengeance... With wings of midnight and an affinity for shadows, Jason courts darkness. But now, with the Archangel Neha's consort lying murdered in the jewel-studded palace that was his prison and her rage threatening cataclysmic devastation, Jason steps into the light, knowing he must unearth the murderer before it is too late. Earning Neha's trust comes at a price--Jason must tie himself to her bloodline through the Princess Mahiya, a woman with secrets so dangerous, she trusts no one. Least of all an enemy spymaster. With only their relentless hunt for a violent, intelligent killer to unite them, Jason and Mahiya embark on a quest that leads to a centuries-old nightmare... and to the dark storm of an unexpected passion that threatens to drench them both in blood. New York Times bestselling author Nalini Singh is passionate about writing. Though she's traveled as far afield as the deserts of China, the Highlands of Scotland, and the temples of Japan, it is the journey of the imagination that fascinates her the most. She's beyond delighted to be able to follow her dream as a writer. Nalini lives and works in beautiful New Zealand. You can contact her directly through her website. While visiting the site, Nalini invites you to join her newsletter for up-to-date news about both the Psy-Changeling and Guild Hunter series, as well as fun exclusive extras, including free short stories set in her worlds.